Summer is not necessarily the most inspiring time to cook for me, especially when the temperatures rise above 25 °C. All the more reason to create some no cook recipes and get out and enjoy the wonderful weather. The children are at home and our meals revolve around things that are easy-going, don’t require a lot of ingredients and that hydrate. Less time at the stove and more raw foods in general and more focus on simplifying things. 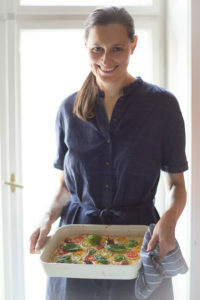 Besides gazpacho, I would say my favorite summer dishes are panzanella, pasta salad and the likes. 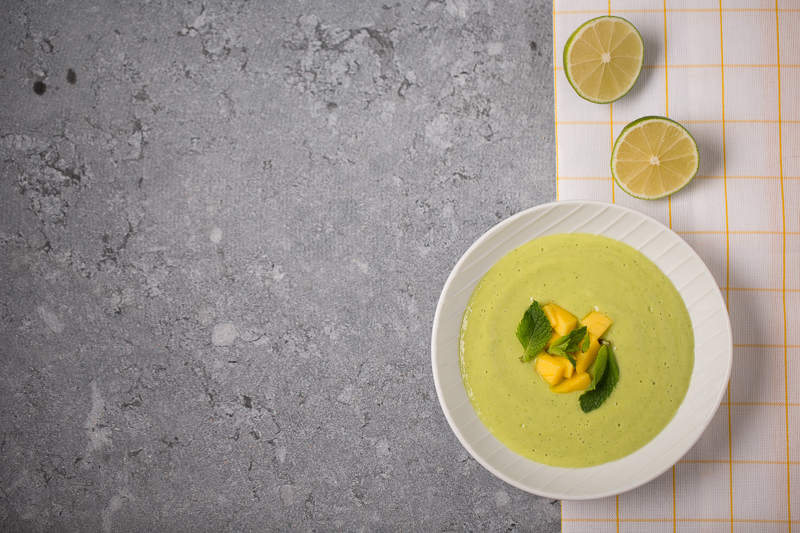 Gazpacho is something that I really enjoy in the summer months and I have tried many different versions from strawberries to melon. The traditional one is of course unbeatable but I like to experiment, as you know and when I get an idea, I have to try it out. 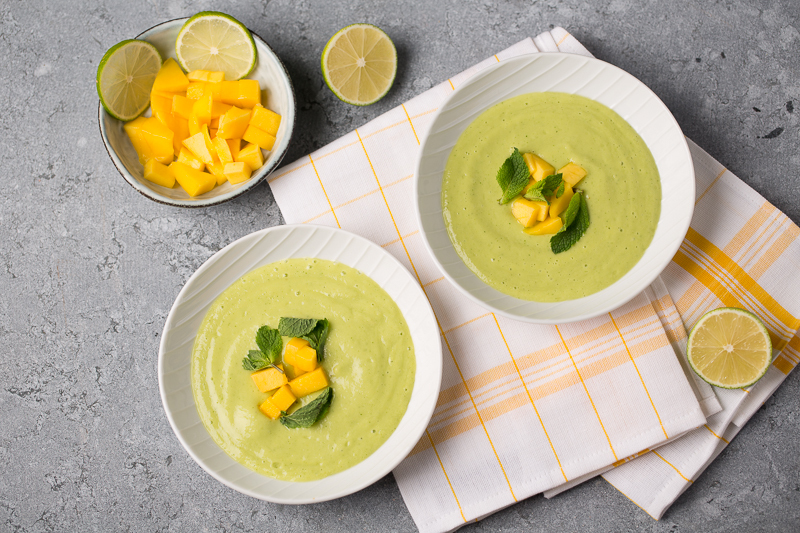 The other day I made a simple dinner with quinoa, sweet potato wedges and a simple salad with mangos, cucumbers, mint and avocado and then I thought about combining the salad ingredients to create a kind of gazpacho. 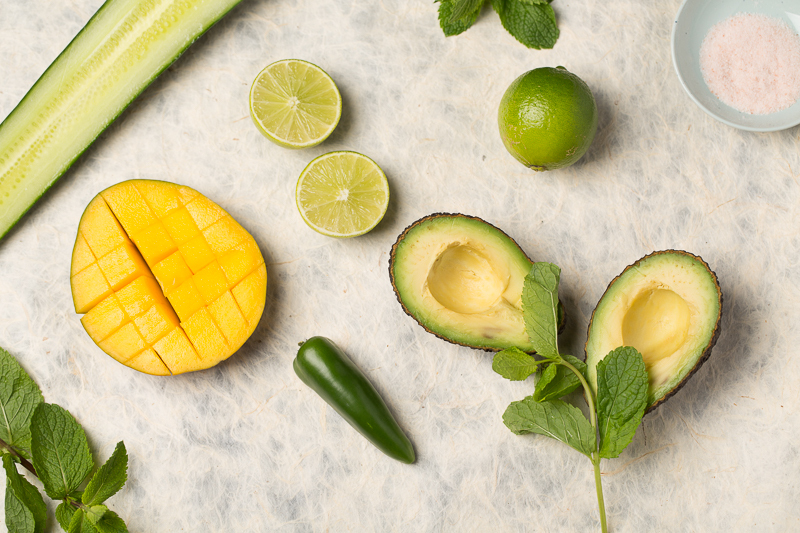 Mango gazpacho was born. The entire process takes about 5 minutes to make and if you want the full flavor development I do recommend chilling it in the fridge for a few hours, but you don’t need to. I had to laugh while we were shooting this dish because the shooting was so much longer than it takes to actually make the dish. Such is the life of a food blogger. My kids get really impatient when we shoot because everything looks so much more appetizing than when I just plop their food on their plate and they are super hungry when they see that the food looks beautiful. Normally I try to shoot when they are not at home but now during the summer holidays they are more present and then they are also more involved. Its not a bad thing, just a little different. I’ve also noticed that they treat the food with more respect and don’t eat much when it has been beautifully plated. I also don’t have a great urge to eat a lot when I prepare something. Its as if the whole process of making, styling and shooting satiates me in a different way than if I just cook. Nevertheless I enjoy the moments more intensely when someone else cooks for me or if I go out to eat. I can really feel the energy that food provides and how much care has gone into preparing it. The idea of women returning to the stove to cook and nurture their families is seen as an act of strength and empowerment. That which nurtures us also creates a foundation for caring for our society on all levels. I felt really moved to hear her words. The idea of a feminist only being a career driven women who sacrifices having a family to climb the social ladder is one I have never connected to. I think there is room for more definitions of feminism and one that acknowledges a broader spectrum of role models. The humble farmer has the capacity to create and nourish our earth in more ways than we can see with our narrow societal definitions of success. I hope that more women will have the courage to speak up and share their own truths about what they feel to be liberating and fulfilling. I have found great fulfillment in being able to nourish my family all these years. Much of what I do know I have my children to be thankful to. I probably never would have immersed myself so intensely in cooking without them. Purpose is a funny thing. It follows you wherever you go and often takes unexpected turns. 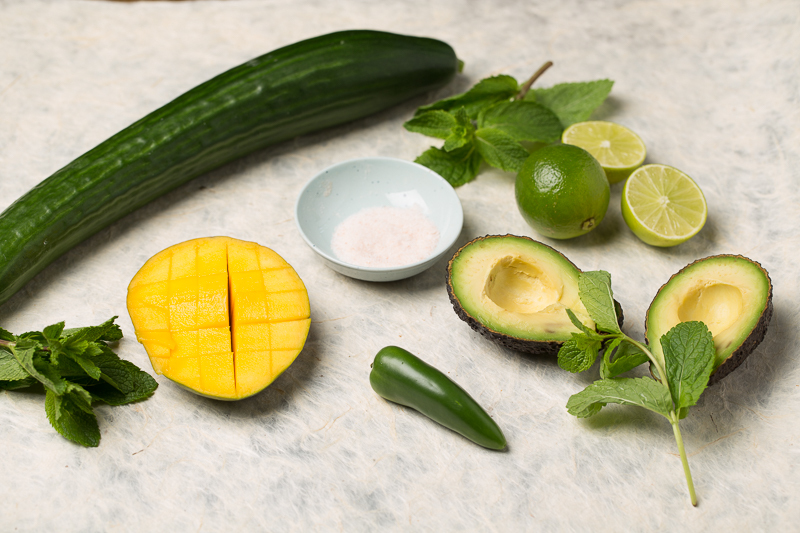 This refreshing meal is probably going to be on repeat all summer long. I encourage you to try other fruity combinations. Anything that is similar from the water content to tomatoes would work. I would like to try a beet and cherry gazpacho from one of my favorite cookbooks On Vegetables. Some other variations to consider: strawberry, cherry, watermelon, canteloupe or honey melon. I’ve tried them all and they are all delicious and refreshing. 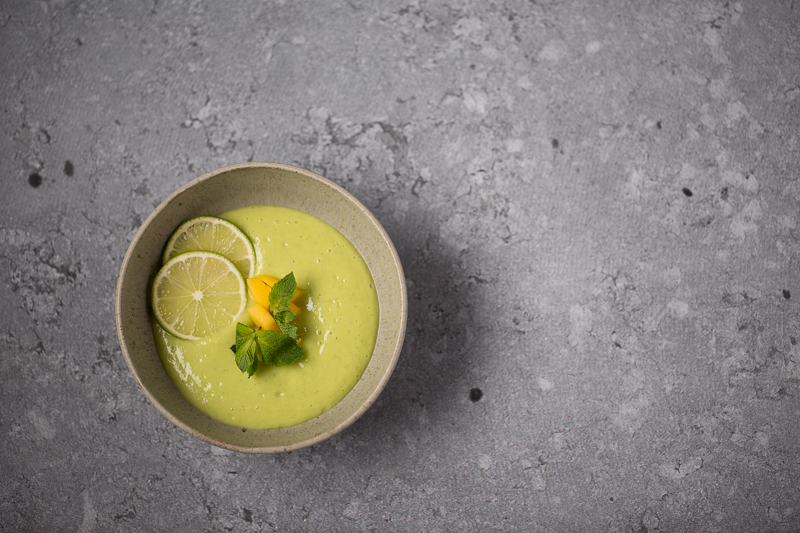 I hope you will try this gazpacho and would love to hear your feedback. If you share it on INstagram don’t forget to tag me #vegan__art. I love seeing your versions. Happy summer days! 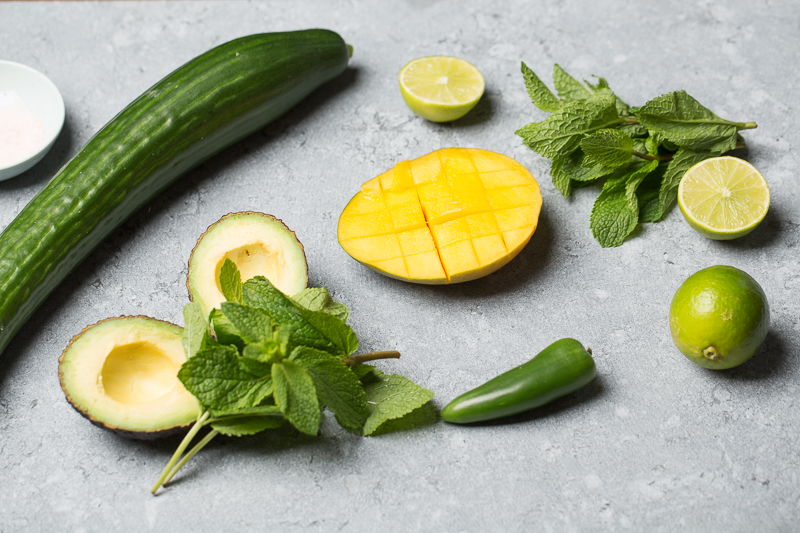 Place all the ingredients in a high speed blender reserving mango, mint and lime to garnish with. Blend on high speed for about 1 minute or until very creamy. Taste and adjust the seasoning to your taste. Place in the fridge for 2 hours to chill through completely. 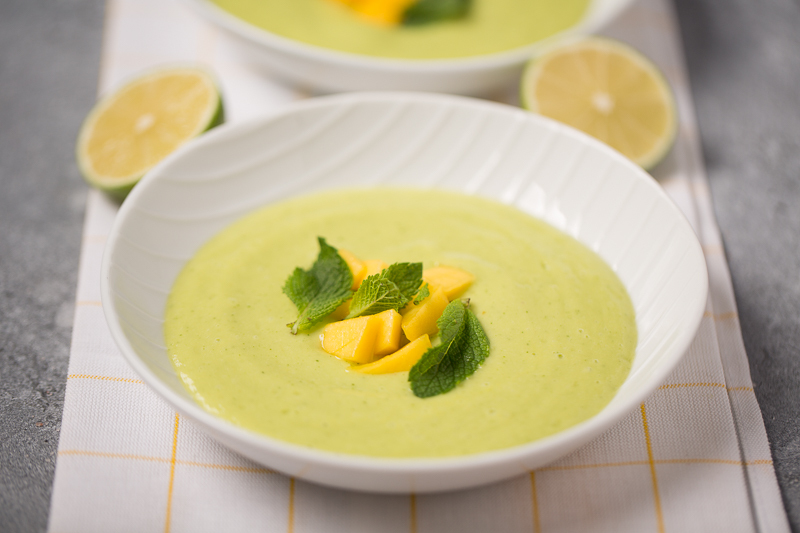 Serve in small bowls or glasses and garnish with mango, mint and lime.